Monday initiated the right way! Hey everyone! Feels like it’s been too long, I hope everyone has been enjoying time with family and friends around these holidays! Also, school is coming to an end which means studying is in full effect! Just make sure you’re taking a break to enjoy the season, and not overflow with stress!! I’ve been enjoying some much needed family time while James had some vacation days! Sometimes little things like having him around to finish the dishes, I’m so greatful for. I got to bang out some workouts while he bathed the girls, and I couldn’t be more appreciative of him as a father. I’m so happy this time of year, and always want to remind everyone to find the best in any situation you are given. No matter how many rough days come this time of year, remember to reflect on how far you’ve come, with whom you have walked with. And Happy Monday!!! What a longggg holiday weekend! It’s a gorgeous Monday and while the sun is still peaking out, I’ve decided to embrace a transition outfit- a two piece that shows some skin, yikes! 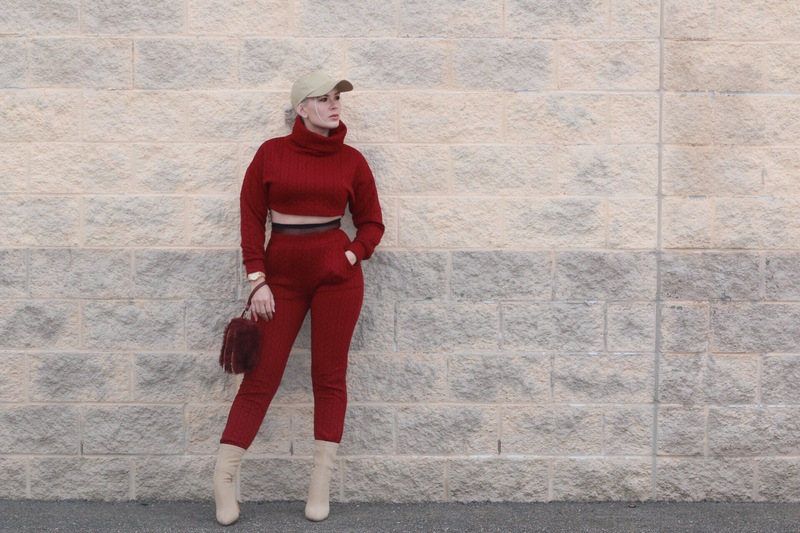 Initiated Brand Made this comfy 2-piece fall set that im in love with! It goes perfectly with sneakers, but today I decided to “dress” it up! 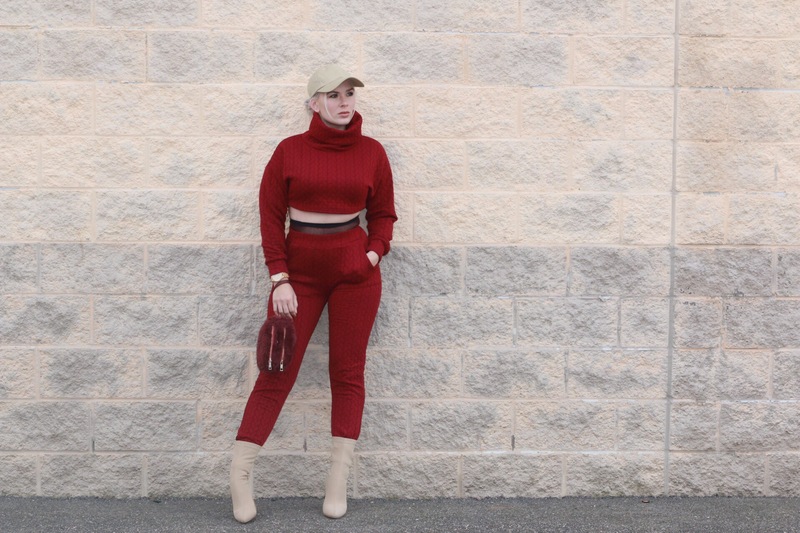 I love the huge turtle neck, this was my way of diving full force into turtle neck season. My absolute favorite staple this time of year! Being 12 weeks postpartum, I’ve definitely jumped into my ‘core’ workouts, however having 2 9+ pound babies has done some damage to my stomach. I decided to throw on some of my favorite stockings underneath (You can’t tell, but they are maroon snake skin printed-I loooove). Wearing these underneath keeps my stomach firm, and plus it gives the outfit a little more edge! I worked with a stylist recently, and received these comfy chunky heels from EGO that I’m crazy about! I wish I grabbed them in black as well because they’re little so comfortable. These are actually a U.K. Size 9, and I’m a 7/7.5 in US. So although they are a little big for me, I throw on a thick fuzzy sock, because come onnnn it’s also fuzzy-sock-season! The quilted pattern of this set gave me inspiration to wear the EGO heels, since they are also a knitter fabric. Who doesn’t love mixing fabrics and patterns? A huge thank you to Team Initiated I’m in love with my set. Ladies if you’re thinking about purchasing definitely go a size up, this one I’m wearing is in a medium, and the waist is super tight, so I had to wiggle it up my hips! Maroon is a perfect color for the holiday season, and a comfy outfit like this can simple be dressed up-minus my hat collection! I’m obsessed with your boots!